The expected is now the reality – at Roman Noon this Saturday, the Pope named Archbishop Pietro Parolin as his Secretary of State on the retirement of Cardinal Tarcisio Bertone SDB. There is, however, a hitch: while most Vatican appointments take immediate effect upon their announcement, the handover of Stato to Parolin won't occur until Tuesday, October 15th, to give the new holder of the Curia's oldest office sufficient time to return from his posting until now in Venezuela. While today's move restores the custom of a distinguished Stato veteran at the first dicastery's helm, the last time a nuncio was launched into the top post from an assignment in the trenches came in 1929, when Eugenio Pacelli was recalled from Berlin to become Cardinal-Secretary to Pius XI. Of course, nine years later Pacelli was elected to succeed his mentor, taking the name Pius XII. At this moment, in which my appointment as Secretary of State is made public, I desire to express deep and affectionate gratitude to the Holy Father, Francis, for the unmerited trust he is showing me, and to make known to him once again my willingness and complete availability to work with him and under his guidance for the greater glory of God, the good of the Holy Church, and the progress and peace of humanity, that humanity might find reasons to live and to hope. I feel very strongly the grace of this call, which is yet another and the latest of God’s surprises in my life. Above all, I feel the full weight of the responsibility placed upon me: this call entrusts to me a difficult and challenging mission, before which my powers are weak and my abilities poor. For this reason, I entrust myself to the merciful love of the Lord, from whom nothing and no one can ever separate me, and to the prayers of all. I thank all those who have shown and who, starting now, will show me understanding, as well as for any and all manner of help that anyone might desire to offer me in my new undertaking. My thoughts go to my family and to all the persons who have been part of my life: in the parishes into which I was born and in which I served; in the dear Diocese of Vicenza; at Rome; in the countries in which I have worked – from Nigeria, to Mexico, and most recently in Venezuela, which I am sorry to leave. I think also of Pope-emeritus Benedict XVI, who ordained me bishop, I think of the Secretariat of State, which was my home for many years, of His Eminence, Cardinal Tarcisio Bertone, of the other Superiors, colleagues and collaborators and of the whole Roman Curia, as well as of all those who represent the Holy Father and the Holy See diplomatically around the world. I owe a great debt to all. It is with trepidation that I place myself in this new service to the Gospel, to the Church and to Pope Francis, but also with trust and serenity – disposed – as the Holy Father asked us at the beginning [of his pontificate] – to walk, to build and to profess. And, as they say in Venezuela, “¡Que Dios les bendiga!” [God bless you!]. 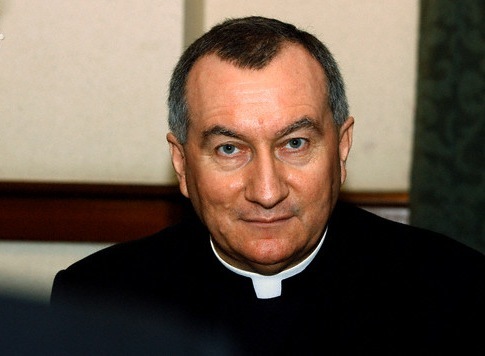 As he prepares to take the top post of a Curia likely to undergo a sweeping systematic reform over the coming months, one element of the incoming Secretary's biography particularly sticks out: as a student at the Gregorian, Parolin wrote his doctoral thesis in canon law on the Synod of Bishops, an organ which Francis has already gone on-record as looking to bulk up in terms of its clout and responsibilities. Alongside the much-anticipated Stato nod, Papa Bergoglio issued his first round of confirmations for Curial officials in their posts this morning, keeping Bertone's four lead deputies in their current slots, as well as retaining Archbishop Georg Gänswein as prefect of the Papal Household. By contrast, Bertone replaced his twin top lieutenants – the Sostituto (Curia chief of staff) and Secretary for Relations with States (foreign minister) – within a year of his appointment as SegStat. Beyond the task of arranging papal audiences and other large Vatican events, Gänswein likewise continues as private secretary to the now Pope-emeritus Benedict. Normally a pro forma piece of a new Pope's first days in office, Francis held off on reconfirming his Curia in the immediate wake of his election, a Holy See statement saying at the time that he "desire[d] a certain period for reflection, prayer and dialogue before making appointments or definitive confirmations" of his officials. The 266th bishop of Rome will mark a half-year in office on September 13th. In tandem with today's announcements, the pontiff met this morning with the top five officials of State: Bertone, the Sostituto and Foreign Secretary – Archbishops Angelo Becciu and Dominique Mamberti – and their respective deputies, the (Oklahoma-born) Assessore Msgr Peter Wells and the Undersecretary for Relations with States, Msgr Antoine Camilleri. Signaling a return to the appointment files after the summer slowdown, Francis also received the prefect of Bishops, the Quebecois Cardinal Marc Ouellet. On a final note, conspicuously left off the confirmation list was Gänswein's deputy – formally termed the "Regent" – at the Papal Household, Msgr Leonardo Sapienza, a member of the Rogationist Fathers. Often seen at Francis' side in lieu of his boss, the elision could indicate Sapienza's transition to another post in the short-term future.